Human Galectin-3, His Tag (GA3-H5247) is expressed from human 293 cells (HEK293). It contains AA Met 1 - Ile 250 (Accession # P17931-1). The protein has a calculated MW of 27.5 kDa. The protein migrates as 35-41 kDa under reducing (R) condition (SDS-PAGE) due to glycosylation. Lyophilized from 0.22 μm filtered solution in 50 mM HEPES, 150 mM NaCl, pH7.4. Normally trehalose is added as protectant before lyophilization. 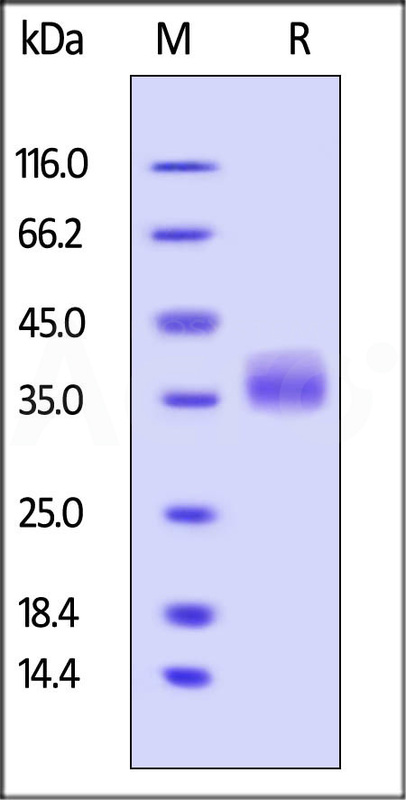 Human Galectin-3, His Tag on SDS-PAGE under reducing (R) condition. The gel was stained overnight with Coomassie Blue. The purity of the protein is greater than 95%. Galectin-3 (Gal-3) is also known as LGALS3, 35 kDa lectin, Carbohydrate-binding protein 35 (CBP 35), Galactose-specific lectin 3, Galactoside-binding protein (GALBP), IgE-binding protein, Laminin-binding protein, Mac-2 antigen, Lectin L-29. Galectin-3 is a member of the lectin family. LGALS3 / Galectin-3 is expressed in the nucleus, cytoplasm, mitochondrion, cell surface, and extracellular space. LGALS3 / Galectin-3 has been shown to be involved in the following biological processes: cell adhesion, cell activation and chemoattraction, cell growth and differentiation, cell cycle, and apoptosis. (1) Dumic J., et al., 2006, BBA General Subjects 1760 (4): 616–635. (2) Liu F., et al., 2002, BBA General Subjects 1572 (2-3): 263–273. (3) Cooper D., 2002, BBA General Subjects 1572 (2-3): 209–231.